I have been craving ribs constantly a lot lately. Generally when I think ribs, I’m thinking of baby backs – those meltingly tender short ribs from the loin of the pig. But just to switch things up, I went with spare ribs for this cook. Spares ribs sit below the baby backs and come from the from the belly side of the pig’s rib cage. Because they do more work (the whole breathing thing), spares have tougher muscles and more connective tissue. That means they also have a richer flavor, but it can be tough to get them tender (think of the difference between a filet mignon and a sirloin). 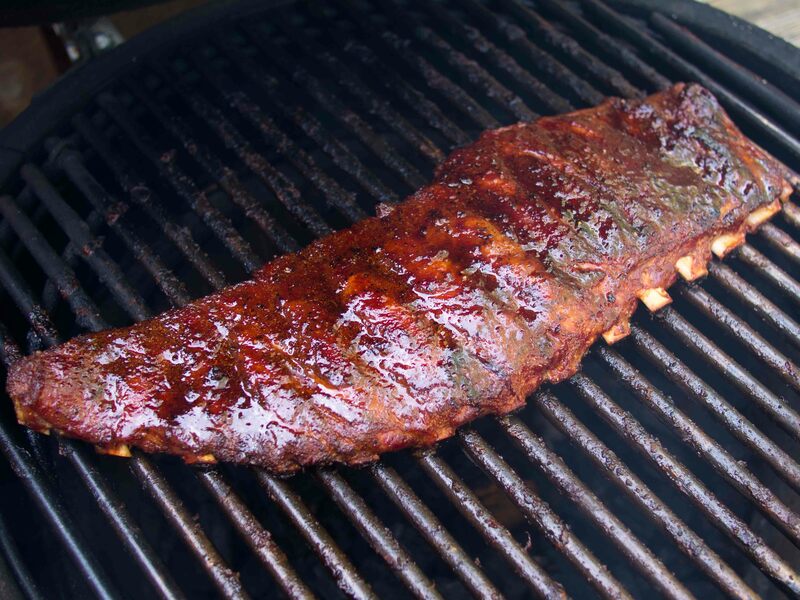 A full rack of spare ribs includes part of the chine (breast) bone and the connective tissue between the chine and the ribs themselves. I trimmed all of the non-rib bits off to make a St.Louis-style rack that is easier to handle and cooks more evenly. I also removed the tough membrane that covered the bone side of the ribs to let more flavor in. After the ribs were trimmed, I gave them a generous dusting of Plowboys Yardbird Rub and then stashed them in the fridge while I got the Big Green Egg fired up. I set the Big Green Egg up for a raised direct cook at 250°F, using a Woo2 ring to get the cooking grate further from the heat. When the Egg was up to temp I added some persimmon wood for smoke and put the ribs on. Spare ribs take 5 to 6 hours to cook. I started them bone side down and then flipped them end-to-end and top-to-bottom ever hour. At hour 5 they started showing signs of doneness – meat pulling back from the bone, and meat cracking when I lifted up the rack at the end. I checked the internal temp (love my Thermapen for this as it can get right into the middle of the rib meat) and it read 180°F. Pretty much perfect. I sauced the ribs on both sides with Pomegranate Pig Barbeque Sauce and let them cook for 10 minutes. I sauced the meat side and let them go for another 10, then sauced the meat side again and moved them off to a plate to rest for 10 minutes. These have got to be among the best ribs I’ve ever made! 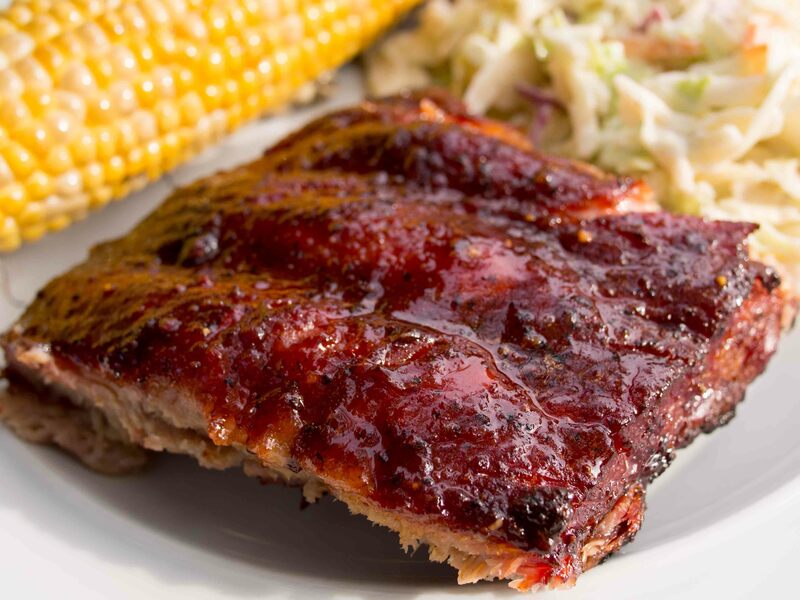 Love the Plowboys rub and the way it works with the sweet tangyness of the sauce. Even though I cooked these raised over direct heat (no plate setter to diffuse the heat), they came out moist and tender. I like ribs cooked to the ever-so-slightly-not-yet-falling-off-the-bone point, and I nailed that here. My only (very minor) disappointment is that the persimmon wood didn’t give me as much smoke flavor as I would have liked. A four bone serving is about 600 calories and 10 Weight Watchers points. I judged a BBQ contest today and after 26 samples, I’m not really in the mood for any more BBQ right now but those ribs really look good.